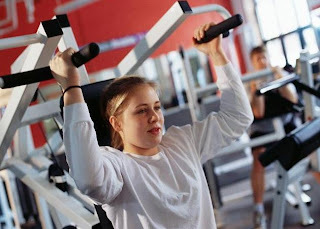 Weight or strength training is a very important component of an exercise program. Many people who work out in the gym or start any exercise program always only focus on the cardio. If you are one of those weight machine phobic folks, does any of the below describes you? you do not think it is necessary because your auntie, grandpa, etc had exercised all their life and still stay healthy- those days, most people don’t do weight training. Ok, let’s discuss each point in more detail and clear the misconception once and for all, shall we? 1. You have no interest to look like a body builderIt’s not easy to look like a body builder. Body builders are required to undergo very streneous and punishing training regimes. On top of that, there are special diet modifications that they need to do- such as taking food high in protein but not fat and taking certain type of supplements. It’s really not easy to look like Arnold-even if you want to. Arnold had to work very very hard to get that type of muscular body. No, you will not bulk up with weight training. We gals just are not built the same ways as the guys and so, we do not have the hormones to make us bulk up with weight training (ok, there are exceptions- some ladies are musclar in nature but if you fall into that category, you will know because your metabolic rate will be high and you appear more muscular than having fat in your body). For 99% of us, we are just more predisposed of developing adipose tissues than muscles. When we do weight training- we will tend to just look leaner and not look like a man. For some of my fitter ladies friends who are very active in gym, they have tried very hard to built muscles, to the extend of even taking protein shakes. They work very hard in the gym for most days of the week, do lots of strength training. But they still look, well, very much like a girl. Lean and fit. Not huge and muscular. So for ladies when you built muscles, you actually look leaner. For instance, let’s say you are 55kg and you are an avid exerciser, combining weight training and cardio. You compare yourself to another girl of the same weight and height but maintain the weight through only dieting. There is a difference as when you develop more toned look, you actually look slimmer, fitter compared to the person who does not exercise. There are some bulky ladies around who you have seen constantly hanging around the weight area- that may give you the impression that you may bulk due to lifting weights. Let’s discount those female professional body builders who have to adopt special diet and takes lots of hormone altering pills. That leaves us with probably one more type: they are already overweight to begin with. You see, when you do strength training, you built lean muscles. But if you have an existing thick layer of fat, it will make you look bulkier. That’s natural- it is still better than not exercising and developing bulk from fat because at least muscles are more metabolically active. With more lean muscles, you will have better endurance and thus able to sustain your cardio sessions longer. Coupled with reduced caloric intake (especially sweet and fried stuff)- because you would not want to flush away your hard work at the gym rite? Then as that layer of fat gradually reduced, ta…ta…. a leaner, fitter you will appear. It’s the same for guys and gals. Let’s put it like this- any form of exercise, if perform incorrectly or with the wrong posture, can lead to injury. Like yoga, if you attempt to do certain poses too fast, you may end up getting a sprain. Or running, if you run on uneven surfaces wearing the wrong type of shoes, you may sprain your ankle. Sometimes, people try to lift weights that are well beyond their ability- they force it but overbending their lower back muscles or pulling too hard and thus causing injury to a joint. Or they are not sure how an exercise is done and they tried to imitate someone who happens to do the exercise wrongly. The important thing is whenever you are not sure, you have to always ask. Lift weights that you can manage and maintain proper posture, like don’t strain your back, don’t jerk or do it too fast. It will help you to prevent any injuries. You can engage a personal trainer to teach you. Or you can join a class like Body Pump- let the instructor know that you are new so that the instructor can focus and correct you if you are doing the exercises wrongly. If you are self conscious, you can try to locate classes that have less people attending. Else, you can also fall back on your friends who do weights- but you have to exercise your judgement- observe if your friend’s posture is correct, if his movements are too fast or jerky. The internet offers lots of good writeups on the correct techniques of strength training. You can overcome this by getting friends to train together with you. Or you can go during the time when there are less people around such as early in the morning. Slowly, you built your confidence and competency in using the machines. built muscles- cardio alone predominantly helps you to burn fat but it does not really built muscles. 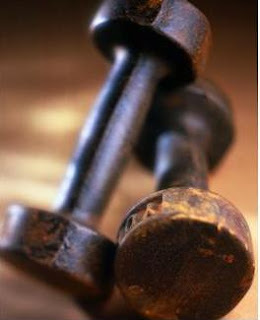 the stronger the muscle is, the more it can absorb shock and thus preventing injuries to the joint. people who only concentrate on cardio but do not do strength training and especially if they were to go on a low carb diet, would risk losing lean body mass (muscle). So the moment they stop exercising, due to being busy or an injury, they will put on weight very easily. Let me tell you- many senior folks that I know suffer from all types of problems ranging from osteoporosis, lower back pain, arthritis, stiffness all over, etc. And they accept these problems as part of aging. Most of them are actively doing housework and going around, and yet they have to live with lots of problems. strengthening muscles around the joints helps the muscles to absorb shock better- especially weak muscles that cause them postural imbalances leading on to stiffness, lower back pain, etc. So, people should not just sit back and accept certain things as part of life. If there is something that can be done to improve our quality of living, especially in the later stages of our lives, we should. After all, we worked hard all our lives in hope to enjoy our golden years. In summary, strength training should be included as an important component of any exercise program. There are lots of misconception going around about strength training and I hope to at least, I’ve helped to clear some of your misconceptions. In the past, I used to do mostly cardio and tend to stay away from the weight machines. Now, it’s an integral part of my workout schedul.e. From there, I’ve seen lots of progress- improved strength that benefits my daily activities, improved cardio endurance so that I burn more calories per workout session, less joint pain, more toned look, etc.